iWood offers two flooring profiles, both with tongue and groove down the long edges and both supplied at your choice of width. The only difference is that profile IWF2 has relief grooves. IWF1 is supplied at your custom width, between 69 and 188mm. 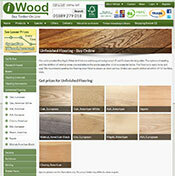 Our flooring pricing calculator suggests 138mm as a standard face width. IWF1 does not have relief grooves in the back, which allows the floor board to be laid either face up if you have a preference for the look of one particular side. Again, IWF2 is provided at your choice of width. IWF2 has relief grooves which are designed to take the stress out of the timber, lessening the effect of warping and cupping. Relief grooves are only usually a consideration on wider boards. Please feel free to call us on 01889 279 018 if you would like to discuss the need for relief grooves on your or your client's flooring.